Bullets are heard every day in the world's most militarised zone, but shots fired on goal by Danish Farooq have become a revelation in Kashmir. The 22-year-old striker symbolises a fairytale rise by Real Kashmir, the first club from the war-torn Himalayan region to make it into India's top football league. "I have struggled a lot. But whatever the situation, I try not to miss practice," said Farooq, whose father was also a professional footballer, playing for Mohammedan Sporting, one of India's oldest clubs. "Playing in the I-League is a dream come true and I am living that dream every day." "If you are a Kashmiri, even if you are a sportsperson, you are labelled a terrorist," said midfielder Khalid Qayoom. "We want to change that perception. Kashmiris are not terrorists, it is just a label thrust on us." But there were stark reminders of the troubles outside the stadium -- which is covered with snow for much of the football season -- after his team's 1-0 home win over Chennai City last week. Chattoo said Real Kashmir started as "a joke". "We just threw out the idea and went step-by-step. I had no idea how far it would go," he said. The pair brought on as coach Scotland's David Robertson, a former Aberdeen and Rangers defender, while Adidas agreed to a kit sponsorship -- the only Indian team to get the sportswear giant's money. "We found our calling when we got to know... how the team has set on a mission to bring a positive change in the valley," said Adidas marketing chief Sharad Singla. "I was ready to go. But then the club owner persuaded me to stay, and now I am so glad that he did that," he said. 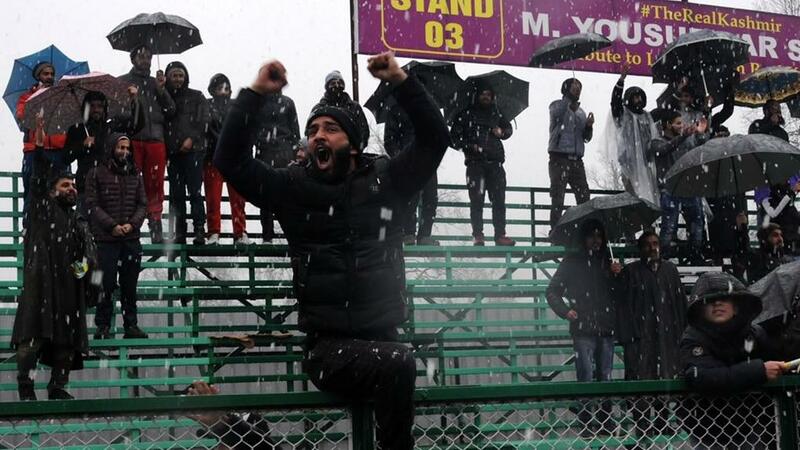 "Overall for me the pleasing thing is that the success of the team has put Kashmir on the football map." Local under-15 coach Owais Farooq said Real Kashmir's sudden triumphs had brought about a surge of interest in the sport among Kashmir's youngsters. "I receive so many calls every day from parents who want to enrol their children in training programmes but we don't have enough grounds to train," he said. Football is an afterthought in cricket-mad India, and the country's 103rd-ranked international side is a notorious underachiever which has never participated in a World Cup. "You can see the love that the people have given us," said club co-owner Meraj. "That's the biggest takeaway for us." "I have been hooked on it ever since," he said. "When I watch the game I forget my troubles. It's so good to have something apart from violence and killings to talk about."